1 Blend the Knorr Pork Stock Cube with the oil to make a paste. Mix in the sage and mustard. 2 Cut each apple into eighths and remove the core. 3 Gently melt the Flora in a small frying pan. Add the lemon juice and dissolve the sugar into it. Gently brown the wedges of apple on both sides to caramelise. Take care not to overcook them. 4 Take the medallions of pork and spread each one with the paste. 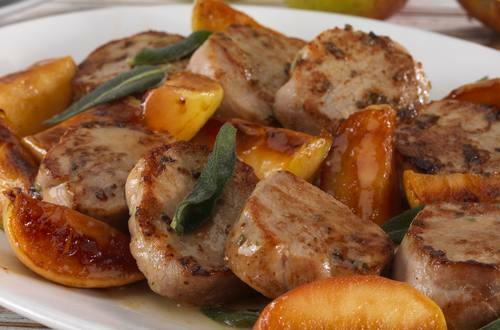 Heat a separate large frying pan, when it is hot, add the slices of pork fillet and pan fry until they are lightly golden. They will take about 1-2 minutes each side to cook. 5 Serve each one with a few wedges of apple and some sage leaves to garnish.